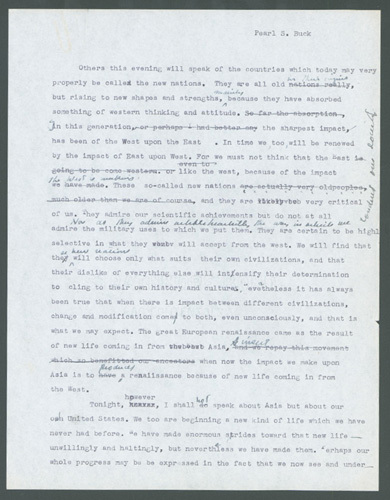 Typewritten Manuscript, seven full pages, quarto, undated. 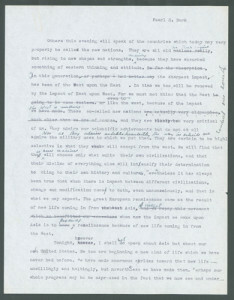 Buck’s speech, concerning relations between the United States and the Asian countries and her peoples, is heavily revised and corrected by the author in ink and pencil [these are shown in italic]. With a carbon copy of the corrected draft, six and a half pages, quarto. “Others this evening will speak of the countries which today may very properly be called the new nations. They are all old in their origins, but rising to new shapes and strengths, mainly because they have absorbed something of western thinking and attitude. In this generation, the sharpest impact has been of the West upon the East. In time we, too, will be renewed by the impact of East upon West. For we must not think that the East is like the west, because of the impact the West is making. These so-called new nations…they are very critical of us. They admire our scientific achievements but do not at all admire the military uses to which we put them. Nor do they admire wholeheartedly the way in which we conduct our society. They are certain to be highly selective in what they will accept from the west. We will find that these new nations will choose only what suits their own civilizations, and that their dislike of everything else will intensify their determination to cling to their own history and cultures. Nevertheless it has always been true that when there is impact between different civilizations, change and modification come to both, even unconsciously, and that is what we may expect. The great European renaissance came as a result of new life coming in from Asia [A insert]. To mention influences from only one source in Asia, let me list these three which came from China alone, and China, I think influenced the West less on the whole than India did. 1. The influence of Confucius, through Jesuit priests who came to China as missionaries, surely made the background for the French revolution. It was Confucius who first declared that the ruler should be the servant of the people, and submissive to Heaven. 2. Through Benjamin Franklin and Thomas Jefferson these ideas influenced the development of our own democracy. 3. The British based their civil service examination system upon the system set up by Confucius, and we based our upon the British. “It has always been a matter of wonder to me that we in our study of education have not recognized out own debt to Asia. To mention only one name again, Confucius has perhaps been more important to us that Plato and Aristotle. Confucius by the way, was not the stuffy and conventional philosopher he is commonly thought to be. He was a man of revolutionary ideas and practice, and this will one day be understood. He is under a cloud with modern young Chinese, but the cloud will pass. I suggest you watch for a book on Confucius by Hindu Gleasner Creel if you’d like to have a fresh appraisal of Confucius in Chinese history. Well, we now repay the rich life that came to our ancestors from Asia and which benefitted them so much, when now the impact we make upon Asia is to produce a renaissance because of new life coming in from the West. “Tonight, however, I shall not speak about Asia but about our own United States. We too are beginning a new kind of life which we have never had before. We have made enormous strides toward that new life — unwillingly and haltingly, but nevertheless we have made them. Perhaps our whole progress may be expressed in the fact that we now see and under[stand], very reluctantly it is true, that we can no longer live in isolation. We cannot ever again retire to our own land and cut the communications. We have to keep the bridges open. The traffic is one way — we are going out to other nations, chiefly as military and occupation forces, it is true. Yet whether we know it or not, the traffic will be two-way, for every time an American leaves home he comes back changed. Sometimes more sometimes less, according to his intelligence and his perceptions. Communications have begun, even though with hostility and name-calling, with stupidities and absurdities and the dangers which must accompany such relationships. In this strange fashion we are even communicating with that new nation Soviet Russia. An Indian gentleman said to me a few weeks ago, ‘What appals the older peoples of the world is the childishness of the interchanges between the Americans and the Russians. We really do not know where to look.’ To which I replied ‘It is best that you know how childish we can be. It is safer for you to know the worst in us, while you admire the best we have.’ It has begun to be one world. We have already passed the possibility of regionalism. We are dealing directly with each other. “Now some of the other nations have an advantage over us, because we are on their shores and they can examine us in their own environment as specimen Americans. Americans in Korea, in Japan, in China, in Europe, are behaving in American ways there and are enlivening if not enlightening the populace. The people in those countries are learning much more about us than we learn about them. This gives them the advantage. Moreover, they have curiosity about us, and that gives them another advantage. We Americans have no curiosities about people. I have had ample proof of this in my years of living here. I suppose the questions that my fellow countrymen have asked me about the peoples of other lands would, in these ten years, be less than fifty. I live with neighbors and working people and friends day in and day out, who have never had the curiosity to ask me any questions whatever, not one, about how life is lived outside their little towns and regions, not to mention outside their nation. They ask no questions whatever. What an amazing thing! What an indictment of our schools that the people who come from them ask no questions! How tragic to consider what a loss this is in interest and amusement and enrichment of life! You who sit here, who have made the effort to leave your homes to hear something new are exceptions, I assure you. Those of us who spend ourselves trying to awaken the minds and hearts of our people to their world know what a heavy task it is. Some sort of dreadful apathy wraps our people round. An intelligent man from Siam said to me the other day, ‘What is this apathy in which your people are sunk? What is this shell around them which can’t be broken?’ I had to answer that I myself do not know. I only know that it is there. “Now we might be able to wait for the slow absorption of knowledge which comes through that one-way traffic I spoke about a few minutes ago if we were a small quiet nation without any particular power or influence. But quite by chance, that tide in the affairs of men which comes only once to man or nation, has caught us now as we are. What we do is of enormous significance because we are rich and, at the moment, the most powerful nation on earth. Try to imagine yourself not an American for a moment. Imagine yourself a European or Englishman, dependent upon the Marshall plan or an Indian, anxious for machinery wherewith to set up a factory which can easily be refused and given to some one else at the slight offence. It is perhaps more than can be asked of a human being that under such circumstances he will try to be truthful with us. On the contrary, he will act in such a way that we do not become angry with him and cut off his supplies. He will not love us for being in our power, but he will be submissive until he gets what he wants. It is we who must not be deceived. The laws of human relationships remain unchanged. Where there is no reciprocity of feeling there is no understanding and where there is no understanding, both sides remain on guard, potential enemies. We are accustomed to doing business solely for material profit. But there are people who measure profit otherwise. I once urged a Chinese teacher to undertake more work in a school for which I was responsible, offering double pay. He was surprised that I was surprised when he refused it. I can support myself [and] family with a single salary, and I can be a better man and father when I am not overworked. Moreover I like to have time to pursue my own thoughts so that I will have something to teach. I want the feeling of knowing that I am a good teacher. This is better than getting the money for two teachers. After all, I am only one teacher! He was not being ethical or anything like that. He was speaking soberly of what he considered profitable from his point of view. I deplore the fact that this one way traffic we maintain with other peoples gives them no opportunity to know us as we really are. They see us at our worst. All people hate an occupying army and military men — as we would hate them. Even Americans are not charming enough to overcome the defect of militarism. An American soldier is a soldier for a’ that. We have no chance to know it, but I assure you that were you on speaking terms with the people in the countries we now occupy you would find it so. Ralph Linto in his new book soon to be published, called THE REST OF THE WORLD, says that hold-ups in Japan were almost unknown before the American army came in. Tell of Korean artists and H.
“We are, in short, what is called our own worst enemies. And why? I think it is because we still do not have the two-way traffic which we need with other peoples. Our children grow up without a world sense. They are fixed within a little American world, so fixed that curiosities are dead by the time they are fifteen, certainly by the time they are finished college. What they have do not seem to survive the pressures of our economy. Yet it seems to me that the whole purpose of education is to create curiosity. The emphasis in education ought to be on what has not been read, what has not yet been seen, what remains to be studied, instead of, as now, upon completion of something. We need, in short, to change our perspectives. “I don’t know how you wake a people up. If it is not done for interest’s sake, pleasure’s sake, if it is not done for the enrichment of enjoyment, because to sleep away one’s life is a dull business, then I suppose we shall have to wait for the alarm clock and necessity. Some day we will need other peoples as badly as today they need us and then we will have to think about them and consider how to please them. We may need allies in a war, or we may need places to trade, to pull ourselves out of a depression. “Certainly we cannot be so silly as to think that this moment, which is so much our own, will remain always so. Do you know what really defeated the Roman empire? It was the camels which the men of North Africa used. The Romans were accustomed to horses and the camels could outrun and outlast horses. But the Romans just couldn’t see themselves riding camels and they died before they would learn.